Still confused with the hour change in time, I woke feeling a deep dread in my belly after yesterdays sketchy ride on the dirt road from the Namibian border on the Orange River to the town of Rosh Pinah, I seriously didn’t want fight my way back along that road to the intersection, where we would turn and head east along the Orange River to Ai-Ali Hot Springs. But as soon as my wheels touched the gravel road, something odd happened. 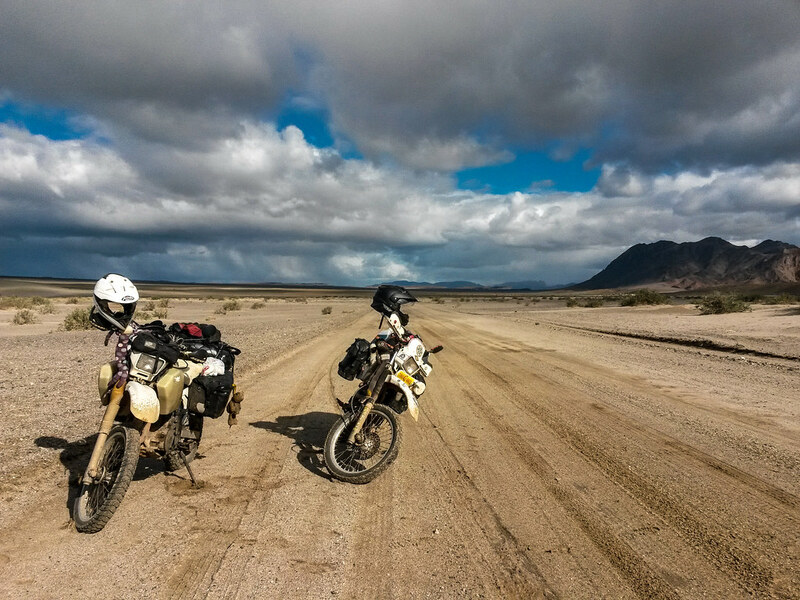 My motorcycle floated down the road towards the Orange River. It left me wondering why I had some much trouble the day before. It’s amazing the difference in motor skills once you have slept and eaten. We eased along at a great pace but were stopped at the junction by two army people. They asked us where we had come from and where we are going. It had been a long time since I’ve been interrogated by the army. It felt like a novelty and reminded me that we had left the safety of South Africa and headed into what the South Africans call “Africa”. 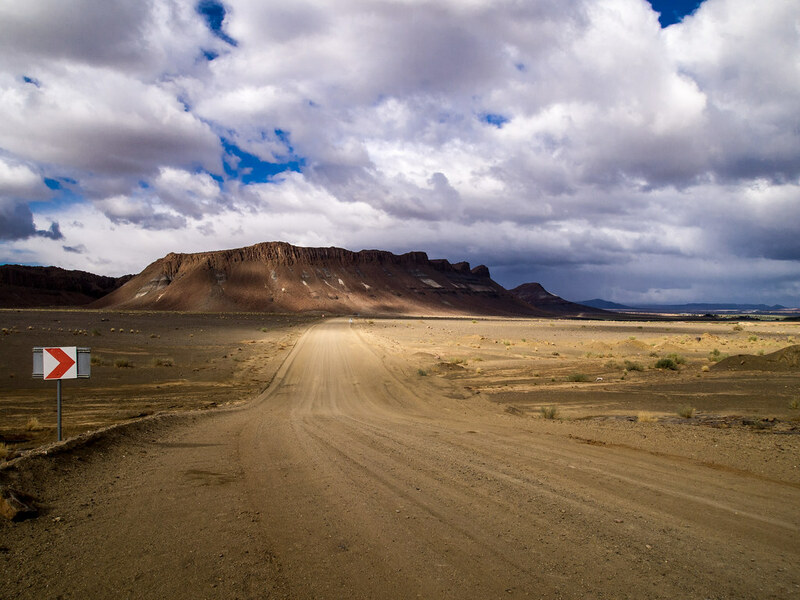 We answered their questions, thinking he must have been ensuring we were not diamond hunters or were planning to smuggle ourselves across the Orange River back into South Africa. We never asked, or complained when they lifted the barrier and said “You should be ok”. As soon as I rode off we were taken into a series of narrow twist and turns framed by towering rock walls. Each blind corner that appeared in front of me, my thumb dived for my horn but it had long given up and I tentatively rounded the corner. I was so excited. I stopped my bike to look over to Mike and shared my excitement with him. “Do you know what” Mike looked around “Three years ago, I stopped in this exact spot here, because I saw my first monkey in Africa here!” Three years ago, he was six months into his down the west coast of Africa trip which seemed to lack all the animals Africa is known for! However, it was a great coincidence that I happened to stop in the same location, it just lacked monkeys. 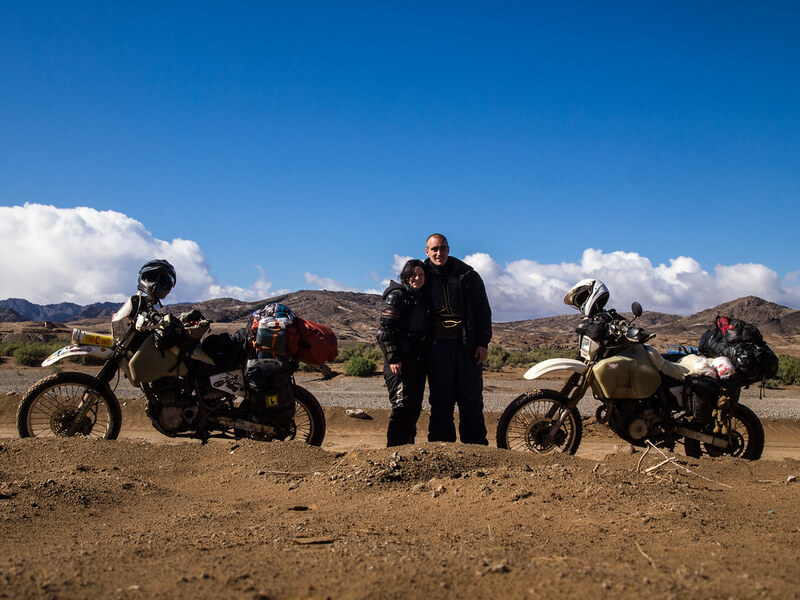 Since Lesotho, Mike and I haven’t done any dirt riding due to our long stay in Cape Town. The road was littered with full width mud puddles that went on for meters. I stopped to look at them and create a path in my head before barreling into them. As I tackled the first one, I felt my bike sliding around underneath me. But I was managing to hold it upright and moving forward at a consistent pace. We rode on and eventually the mud eased up and the cars that came towards us started to look clean again. The turn North to Ai-Ais arrived and we now we are riding between two mountain ranges. The one on the right eased out into flat plains. It was so beautiful. I could feel the firm sand under my tires and my motorcycle behaving, then all of a sudden I see Mike sinking down and wobbling from side to side. It was seconds before I hit the same spot, with just with enough time to change down a gear but not enough time to slow down efficiently. My wobble wasn’t as spectacular but I feel the bike sink into the sand and start to drag my rear wheel down. I pull on the throttle to open up and kick myself out of the pending crash. We make it through the the watery sandy spot only to move into a long stretch of soft soft sand. My back wheel was still biting in. I began to wonder if it’s the 10 kgs of extra fuel I am carrying on the back that was dragging me down. I felt my bike behaving like both my tires are blown, now I started to get quite nervous and shaky. I saw Mike make a fist which is our sign he wants to stop and take a break. He stops and quickly looks down at his tires. “He must have felt the same strange wobble” I thought to myself. Pulling up next to him, I let out a nervous laughter while taking off my helmet. Boy I needed this break to shake loose the nerves, check my tires and put as much fuel into my tank as possible to lighten up the rear. As we stood in the middle of the road, laughing and taking photos I see my bike slowly sink into the sand even with its huge foot on my side stand, so I have to prop it up with a stone. Once we felt good to go again, my bike was at such a strange angle I couldn’t get on it, let alone balance and push the kick starter. Mike balanced the bike upright and kicked the bike for me from the side of the bike. I’m not even tall enough to do this! For the rest of the trip to Ai-Ais Hot Springs, the road was amazing. We zoomed along with warm hearts and big smiles. I just could not wait until I could soak my body into the natural hot pools and have a rest day. It’s not really a rest day when its full of little chores. We had to wash our clothes, fix my odd electrical problem (When I turn off the bike with the key, sometimes it wouldn’t turn off) and replace my sump plug washer. Mike wanted to check tappets and his spark plug. We discovered that one of his spark plugs had almost wound itself out and when we put a new one back in, we discovered the thread in the engine was slightly damaged. This made us sit down and ponder our options over lunch as we didn’t want to ruin or completely snap off the thread while being in the middle of nowhere. As a consolation prize for all our hard work. We jumped into the pools Ai-Ais is famous for. However, we were shocked to discover that they cool the pools down from a natural 65 deg C to a mere 30 degs. It was freezing and not what we were looking for. We stayed submerged for as long as possible but then had to make a run for the hot showers to warm up. 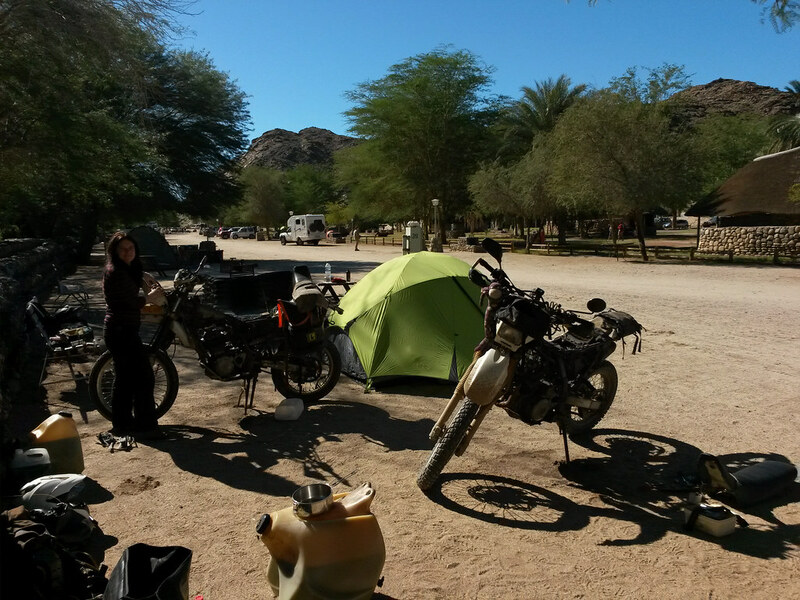 That night, I went to sleep in our tent happy our bikes were looking good considering what we had just put them through and we were now feeling a lot more comfortable again on dirt roads as in the next coming few days we would only see about 200 kilometers of asphalt! Wonderful! I ove your blog writing when it is recent events. It sunds like you are writing what you are living. I know the feeling of “on the road again” I get it when I get in my car, by myself, and go for a decent drive. Hoping for good weather and great scenery, i can stop where i like for as long as i like to soak the place up. Makes me happy. Thanks Chriss, I am trying hard to keep on top of things this time around. I try to spend an hour or two each night to write down my thoughts and feelings. However, it is pretty hard to maintain when you are so so tired at the end of each day.